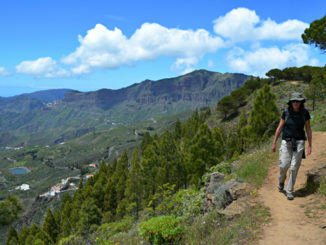 When we put together our plans for walking across Gran Canaria (again) we thought we’d accounted for most things. There was one major obstacle we’d overlooked. 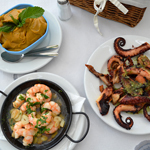 The day we planned to walk from the Agaete Valley into the Tamadaba Natural Park was also the Dia de Canarias, when the local population celebrated in a variety of ways. One of them was probably the biggest rally of the year on Gran Canaria, which just happened to coincide with part of our route. 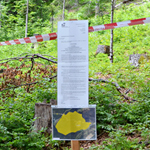 Only 500 metres or so, but enough to close the section of road we had to pass through. Thanks to Oscar, a local font of all sorts of information, we knew that the cars would growl through this section twice during the morning, which meant we had a potential window of opportunity… if our timing was spot on. 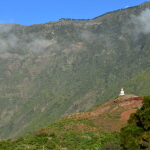 Not knowing exactly what we’d encounter, we set off into the depths of the Agaete Valley, a veritable greenhouse where the May sun felt more like the mid-August sun. Wide-brimmed hats did their best to bat away the heat, but even by early morning the sweat was flowing like the rushing water which fed the old lavaderos (communal washing area) on our route into the valley the previous day. Then it had been a hot and sweaty, steep descent through a lost world of a ravine with thick cane curtains that would have benefited from a machete attack and where wild flowers mingling with soft grasses obscured the path. 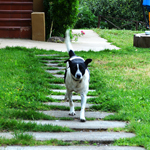 It had been exhilarating, but it required slow and steady progress as we picked our way carefully down the ravine. However, as we looked over the previous day’s path from the neighbouring barranco, we watched a couple of local men skip down it easily. Both men had crates of cerveza casually perched on their shoulders; clearly not as challenging a path as we’d thought. 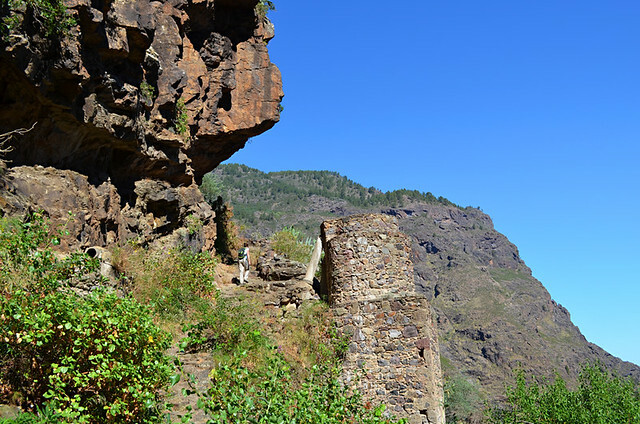 Our route out of the lush valley wasn’t quite so steep and the path was much easier to negotiate as it climbed past the stone tower of an old mill; the steep cliffs on one side of the path offering brief respite now and again from a sun who craned above them to try to get at us. Every so often we stopped to take time to devour views which were of the sort that would confound those who pigeon-hole the Canary Islands. 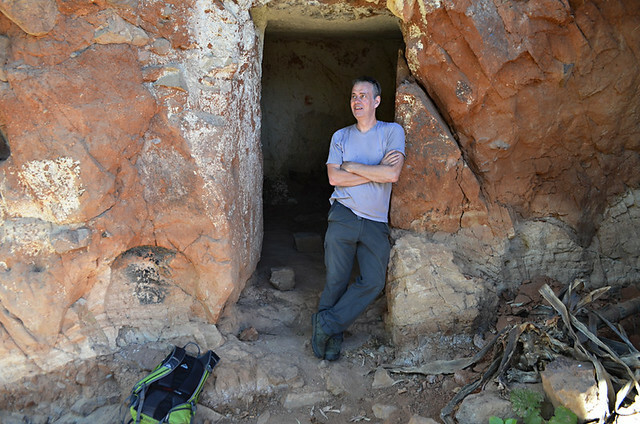 After a kilometre of climbing, an abandoned cave house provided sweet, cool shade for a few moments before we exposed ourselves to the sun for another ascent to reach a hamlet where the cave houses are still occupied. It sounds more primitive than it actually is, but an impressive sight nonetheless. For much of the climb we could hear the roar of rally cars reverberating around the normally silent ravines. 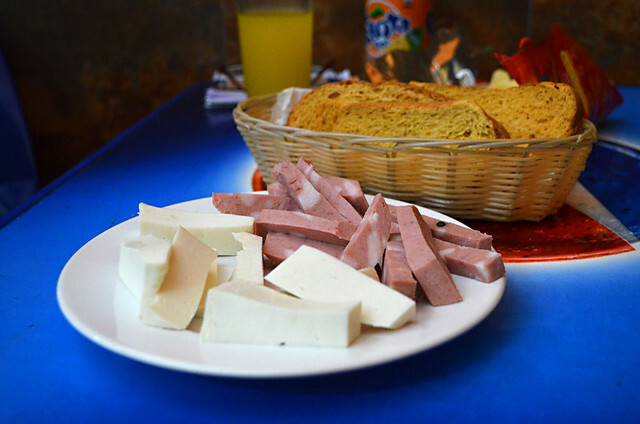 But by the time we reached the narrow road at El Hornillo, the world around us had grown silent. We quickened our pace, hoping our luck was in. We’d expected crowds, but there was only one observer at the junction where our path crossed with the rally. He told us we had 10 minutes before the cars were due to return. The walking gods had smiled on us. It was only 500m to Presa de los Pérez; a forest green, man-made lake which looks more like a natural body of water. 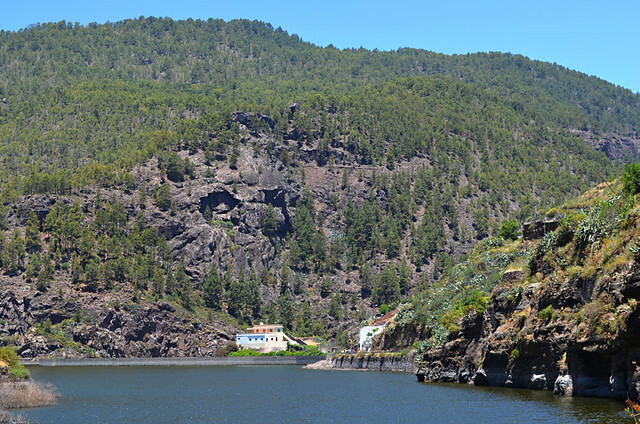 A dam across the reservoir acts as the link between the little hamlet beside the lake and the pine forests of Tamadaba which climbed steeply up from the banks. As we crossed, pausing to take in the drop-away views, we heard the growing roar of the returning cars – the window had been a brief one. Almost immediately on reaching the wilder side of the lake we were joined by a laurel pigeon, tame as you like, which walked along in the shade of the trees beside us for a few metres. 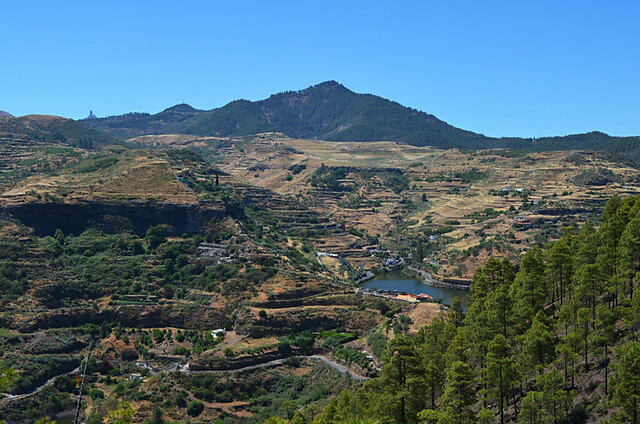 As we climbed through the dappled forest, teasing views opened up to include another man-made lake, Presa de Lugarejos, as well as the sight of the spindly finger of Roque Nublo, for once not obscured by clouds. Bodies of water that look natural are few and far between in the Canary Islands so the two lakes were like rare, sparkling jewels to us. 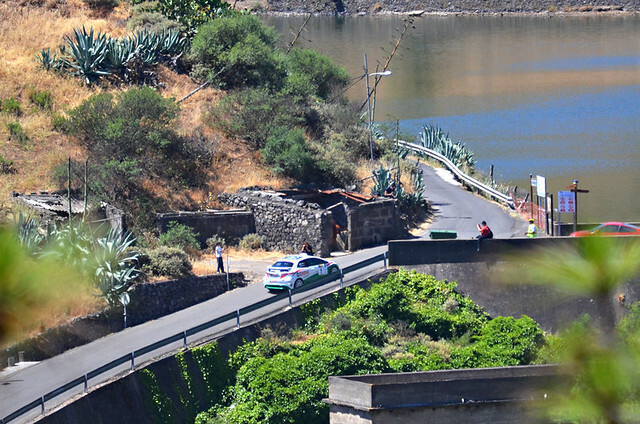 Instead of continuing into the heart of Tamadaba, we descended to the shores of the second presa… just as the second leg of the rally came to an end; unplanned perfect timing yet again. As we followed the normally empty road around the emerald water to the one and only bar in the area – an unnamed affair that doubled as the local shop selling the most bizarre range of products including a doll in fishnets and thigh length boots – we discovered our timing coinciding with the end of the rally had an unexpected bonus. The spectators departed with the cars leaving the bar, which had been overflowing with locals, relatively empty. 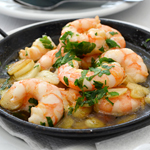 However, the popular choice of tapas in the bar (all the guys at the bar had it in front of them) didn’t quite match the quality of our walk through the ravine and around the lakes. But hey, we’d successfully completed a cracker of a walking route without being hit by a rally car. A result that was almost enough to make our tapa of brick-sized chunks of mortadelo with lardy-looking cheese taste delicious. 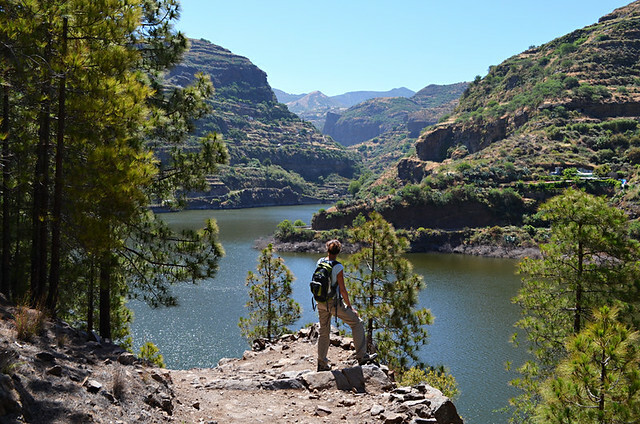 We walked this trail whilst researching routes for Inntravel’s Canyons, Caves and Coast Gran Canaria walking holiday which, although we say so ourselves, is an absolute stormer of an itinerant walking holiday.